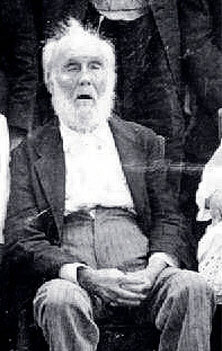 Robert Franklin Guttery was the father of William "Will" Guthrie. Robert was born July 1, 1831 in Walker County, Alabama. He was the son of Reverend Johnson Guttery and Mary Wilson. Robert Guttery married Gracie Frances Nesmith December 16, 1852 in Jasper, Walker County, Alabama. Gracie Nesmith was the daughter of William Nesmith and Martha "Patsy" O'Rear. Robert claimed this marriage record existed in a family Bible. The Court House in Walker County burned and records were destroyed by fire. Robert and Gracie Guttery are known to have had nine (9) children: Mary Ann, Johnson, Orlena, Alexander, William "Will", Lieuticia F., Sarah E., John H. and Nancy Jane. Robert F. Guttery received a land patent on the first day of December, 1859. He received 39.88 acres of land in Walker County, Alabama (certificate # 28305). He was a Private in Company L, First Alabama Cavalry, United States Volunteers, during the Civil War. Due to an illness, which he claimed he received during his time in the military, Robert F. Guttery eventually lost the use of his sight. The date of his death is unknown but Robert F. Guttery is buried at the Second Creek Cemetery, Second Creek, Lawrence County, Tennessee. this issued Colt revolver has ben identified to Robert Guttery. It is in the possession of a private collector. Picture submitted by Layne Holley.